The Energy Division of Bord na Móna employs circa 750 staff, rising to 1250 during the harvesting season. Accounting for over €100 million a year, peat production and sales is a significant element of the company. To the forefront are the teams out there on the bogs, harvesting the best dry peat. There’s a beauty all of its own to the midlands, particularly in Cloncreen, Co Offaly, where four men, with almost 150 years of experience between them working Bord na Móna bogs, ply their trade. With Boston Hill in Co Kildare visible in the distance, it’s a flat landscape, coloured by the rich brown of the peat which the team harvests. The easy banter between the men belies the physical work they do and their understanding of each other’s roles. “I’m responsible for machine maintenance,” says fitter Gerry Claffey, which is no mean task given the team’s fleet of two harvesters, three millers, two ridgers, three harrows, one ditcher, one bulldozer and one digger. John Hanley is a harvester driver, Seamus Keating is a ridger driver and Gerard Mulligan is a master of all the tasks. During harvesting season, they take on three harrow men, three miller men, one harvester, one ridger and one bulldozer driver. As with nature, the work has its own rhythm and during the harvest season from April to August or September, these men and nine seasonal workers produce peat: milling, harrowing, ridging and harvesting on a three and a half day cycle at the optimum times to get the best quality and moisture content they can get. Working almost 12-hour shifts, seven days a week on fine days, the team strives to meet its target of 100,000 tonnes of quality peat. “In 20 production seasons, we failed only once to meet our target,” says Gerard, as John adds that the weather in 1997 beat their best efforts. “When the weather is poor, we catch up on maintenance, so we’re ready for the next fine day, we maintain the bog, milling, harrowing and ridging, and watching piles for fires,” says Gerry. Peat production is part of Bord na Móna’s Energy Division under director Dermott Kelly. Half of the company’s 80,000 hectares is in active use which produces up to 4m tonnes of peat a year. Of this, 3m tonnes is used to produce electricity at three peat-fired power plants, two of which (Lough Ree at Lanesboro and West Offaly at Shannonbridge) are owned and operated by ESB and one (Edenderry) owned and operated by Bord na Móna. Of the remainder, 650,000 tonnes, is sold to the Fuels division for use as peat briquettes, while the balance is supplied to the Horticulture business. Milled peat is produced generally from April to September, on bogs that have been drained and developed for at least 5 years. Undrained bog, or virgin bog, has a water content of about 95%. 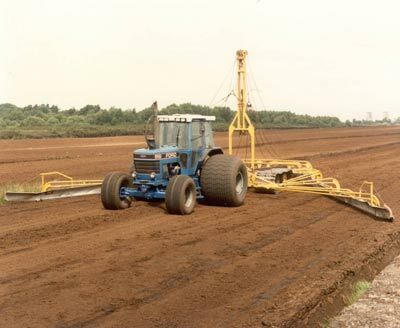 So, the bog surface had to be drained to allow heavy machinery to work and to reduce the drying time of the peat when cut. Meeting targets is just one challenge. “We need to restructure production operations due to increasing costs,” says Paul. “Our core bogs near the stations are becoming exhausted, so we have to go out further to rail transport. Equally, peat from our satellite bogs is transported by road and that’s expensive.” Other issues include the loss of skills as employees retire and the need to meet environmental license requirements regarding peat silt, peat dust and disposal of polythene used to cover stockpiles through the winter. “Bog fires remain a constant threat but we have all the equipment and expertise we need to tackle them, when they do arise. Equally, health and safety is a major concern but we have very strong health and safety standards and ongoing training in place,” says Paul. It’s clear that Ireland’s peatlands have served Bord na Móna – and Ireland – well and their role in changing times will continue to evolve. Peat-fuelled power stations produce 5-6% of Ireland’s electricity.